My name is Phil Johnson (@tracktownphoto). My day job is working as a nurse and I took up sports photography as a hobby in 2008. In 2010, I started TracktownPhoto.com as a place to share my photos. Since then, I’ve had the opportunity to photograph everything from middle-school sports to the Olympic Trials and the World Championships of Track and Field. I’ve also had several images used on billboards, in magazines and all over the web. I use two computers for my photography work. I have an eMachines desktop that I bought several years ago. It has only 2.0GB of RAM and I’ll admit it won’t be long before I send it out to pasture. The other computer I use is an ASUS Notebook U80V, U80A Series with 4GB RAM and a 2.10GHz processor running Windows Vista. It’s lightning fast compared to my desktop, but still quite a bit slower than either of my stepkids computers. All of my data is kept and backed up on WD My Passport external hard drives. I have 5 or 6 of them with data from back to 2008 (and duplicated in most cases). For shooting, I use 8 & 16GB SanDisk Ultra Compact Flash cards for my D4 and D3 and 16GB SanDisk Ultra SD cards for my D600. Cameras have been a completely different story than computers for me. Since 2008, I’ve shot with a large variety of Nikons and currently use the D600, D3, and D4. 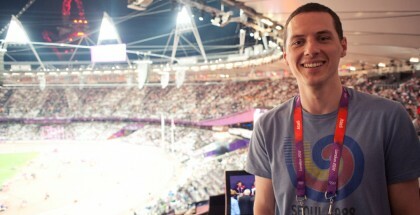 For most sporting events, I carry my D4 and my D600 on my Black Rapid double shoulder strap. I use my D3 as a remote camera. The 4 lenses I use most often are my 70-200/2.8, 24-70/2.8, 14-24/2.8, and my 85/1.8. 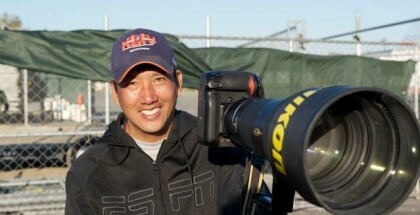 At major sporting events, I’m lucky to have the Nikon Professional Services folks to let me use their equipment. One of my favorite NPS lenses is the 200-400/4.0. For shots taken near the discus and hammer throw ring, I use a remote cage that I constructed myself using metal shelving and hockey sticks. The remote is a Alzo Digital remote which costs about 1/10th the price of the PocketWizard and has worked well. My phone is an iPhone 3GS with shattered case. The phone keeps on working great, so haven’t bothered to get a new one. It’s the model with 32GB flash memory, which many of the much newer models don’t have. In it’s current state, I do get a bit embarrassed from time to time when I use it. Sometimes, I hold my finger over the shattered part of the case. I’ll probably be forced to upgrade this year. I do most of my photo processing in Lightroom 4.2. When I need to blow up photos or do fine tuning, I use Photoshop CS2. TracktownPhoto.com runs on WordPress and is pretty simple way for me to update and display my most recent photos. Thankfully, as far as camera equipment, I’d have to say that I’m currently using my dream setup. At major events, as I mentioned, I’m very lucky to have the support of Nikon Professional Services to fill the gaps in my equipment needs. If there’s a dream setup that I don’t have but would like, It’s clearly computer related. Though I seem to do just fine with my dinosaurs, I’m quite sure that faster processor speeds and graphic card capability would speed up my workflow and make the process a bit smoother.